Through Metro Vision, cities and counties throughout the region work to preserve what’s great about our past, protect what we love about the Denver we live in today, and come together to create a better future for ourselves, our children, and the people who will come to join us here. Through the regional plan, we'll safeguard for coming generations the region’s many desirable qualities by becoming active participants in planning for our present needs with an eye toward our desired future. Meeting the challenges of a rapidly growing older adult population in a constrained funding environment requires an innovative and integrated approach. As the Area Agency on Aging for the region, DRCOG is responsible for planning and funding the delivery of services. In addition, we provide help for people with disabilities and offer the most comprehensive regional resource for aging information and issues in Network of Care. We also lead the way in advocacy, fighting to make life better for people of all ages, incomes and abilities. 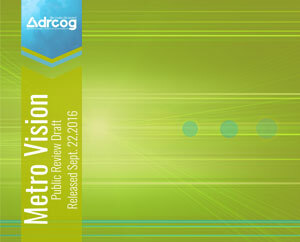 DRCOG is excited to share the metro area’s first-ever regional active transportation plan. The Active Transportation Plan envisions a safe, comfortable and connected network, and highlights opportunities and implementation strategies to improve active transportation across the Denver region. For more than sixty years, elected officials have come together to address challenges and to plan for an excellent region. Members establish guidelines, set policy and allocate funding in the areas of transportation and personal mobility, growth and development and aging and disability resources. What's active transportation? It's self-propelled, human-powered and an important part of improving public health. Metro Vision serves as the region's shared view of its future to make life better for residents. Since its original adoption in 1997, Metro Vision has been updated regularly to reflect current challenges and opportunities. On Wednesday, Jan. 18, the Board of Directors unanimously approved a new and updated plan that provides guidance for growth and development in the metro area out to the year 2040. Explore a repository of open data that support communities in making informed decisions in areas including mobility, land use, and changing demographics. DRCOG's Area Agency on Aging has been working with local partners recently to extend the reach of services into the community. Lutheran Family Services Rocky Mountains recently had two staff members become certified to provide State Health Insurance Assistance Program (SHIP) services, and can now provide a different location for clients to receive face-to-face appointments at its office. Learn more about SHIP and what it does here. Registration is open at biketoworkday.us for those wishing to lead a Bike to Work Day 2019 company effort or organize a station for riders. The June 26 event is expected to draw thousands of cyclists throughout the region, many of whom may be trying out a two-wheeled commute for the first time.